If there is one thing Zenred Salon Bangkok knows more about, its Hair treatments. We love hair treatments and go to great lengths to import some of the best hair treatments in the World. Hair treatments are vital especially in hot humid countries with lots of pollution and UV daily. Hair treatments are also essential for those of us who love to colour and perm hair every few months. Please Note: This is just a small example of some of our Hair Treatments, we actually have a vast choice in the salon, depending on your problems or individual needs. We also have lots of Home Treatments you are Free to purchase and do yourself. We also have some fantastic Travel Treatment kits too. We have some great selections from Daily Argan Oil to Once a fortnight Argan Hair masks that you can do yourself at home. We also have a wide selection of the best sulfate free shampoo and conditioners enriched with Brazilian Keratin to ensure you get all those important nutrients every time you wash without any harmful sulfates. Unfortunately it happens on a weekly basis, we get a call from someone who has had their hair badly damaged at another salon. However our master hairstylist is an alchemist at hair treatments, with 25 years of experience she can repair almost every type of damaged hair. Many people think Brazilian keratin is just for Hair straightening, but that’s not true. 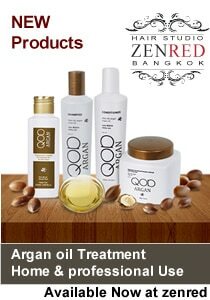 At Zenred Salon Bangkok we have lots of different Keratin treatments, some that Keep the Curl. 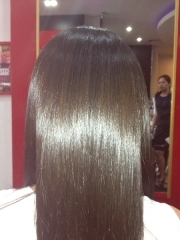 Brazilian keratin is an amazing Hair treatment that can last 3 months or more, It will restore your hairs natural proteins back to how they were when you were a child. It is amazing and our stylists are some of the best in the Industry at Keratinology. Blonde Purple Shampoo and Conditioner have long been virtually impossible to find in Thailand, and frustrating for many Expats and Travellers who need that added protection to keep Blonde hair from turning orange or yellowish due to Chlorine and Sun. We are the first salon in Bangkok to offer not only Purple shampoo and conditioners, we also have Purple Argan Treatments, and even a Brazilian keratin just for Blonde Hair. You will not find a better equipped salon in Thailand for International Hair types.